Answers to our “Ask Me Anything”! On April 30th, in honor of Preservation Week, the Smithsonian Libraries hosted an “Ask Me Anything” (AMA) question and answer session with our book conservator, Katie Wagner. The conversation primarily took place on our Tumblr page, from 12-2pm. 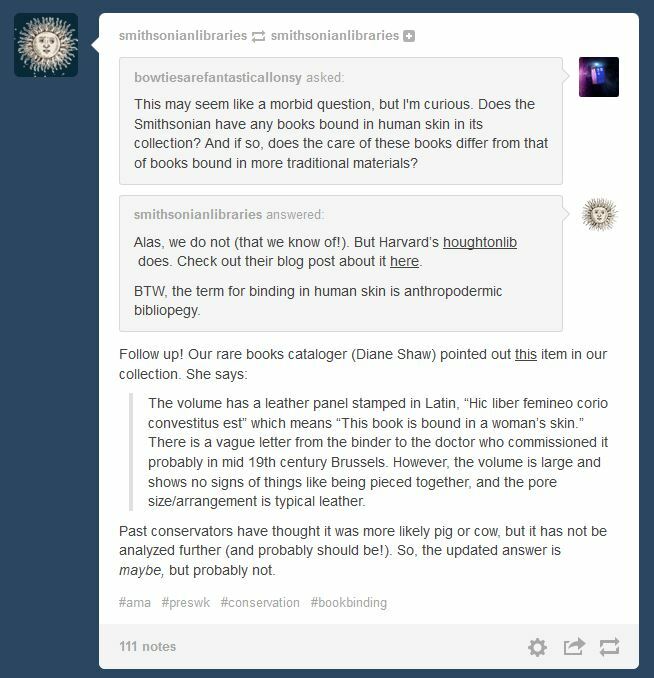 Katie answered about 30 questions, related mostly to book care and treatment, the Libraries and our collections and careers in conservation. 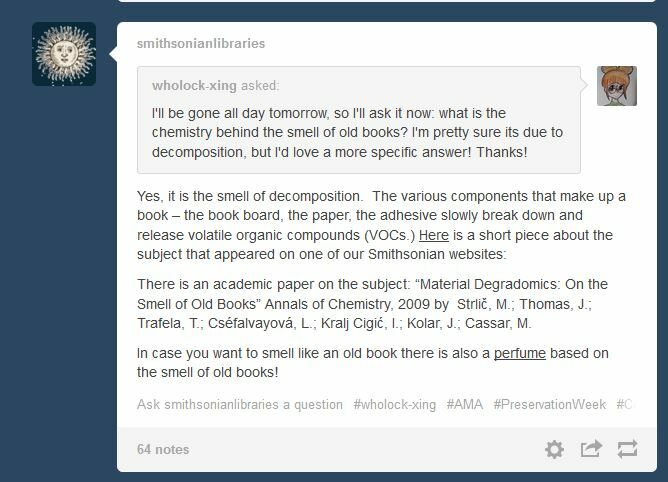 But did you know that the “old book smell” is actually a sign of decomposition? With the help of our rare books cataloger, Diane Shaw, we did uncover a book supposedly bound in human skin in the collection. We are now investigating options for having the book analyzed. Stay tuned for more about the book, the analyzing process and the results! Want to see more? 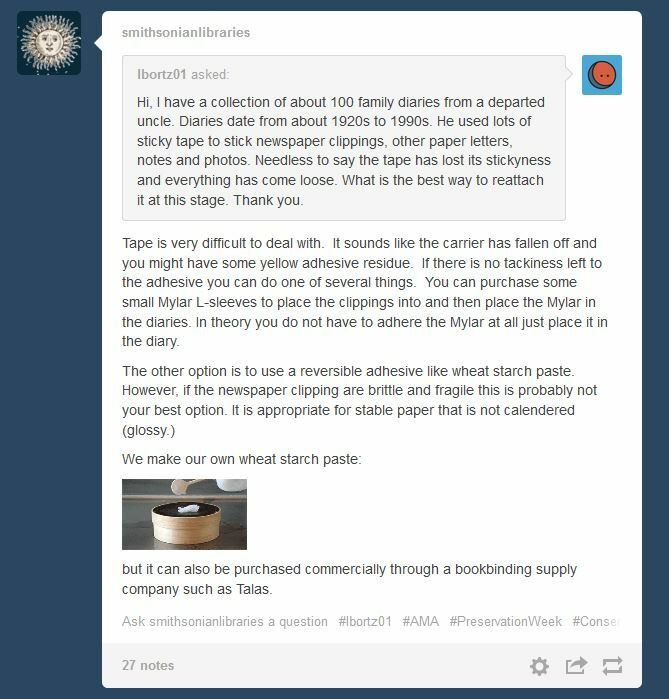 If you missed it the first time, the entire conversation may be viewed here on Tumblr. We had fun and hope you did too! 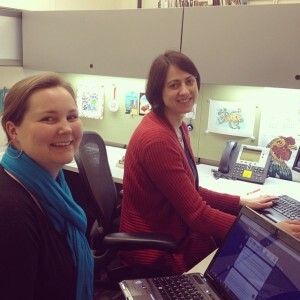 Social media coordinator Erin Rushing (left) and book conservator Katie Wagner (right) preparing to answer questions. Previous Post More cheers for our volunteers!